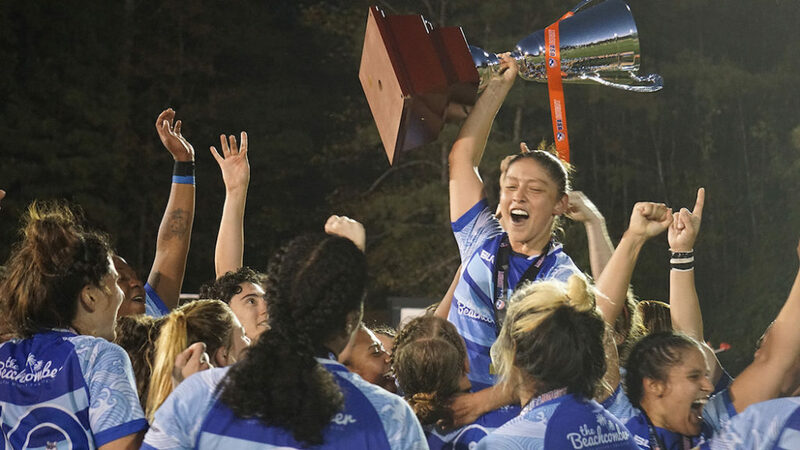 San Diego is the 2018 Women’s Premier League (WPL) national champion, having defeated Glendale 34-28 at Life University in Marietta, Ga. USA Women’s National Team head coach Rob Cain presided over the awards ceremony and named Surfers flanker Sam Pankey as MVP. “We knew this game, coming in, that we had to play the second half because we’d been – we’ve kinda been on our heels each game in the second half, and boy did we step up and play that second half,” Pankey said. San Diego took the first lead when wing Teigan MacDonald finished a series in the try zone, and inside center Megan Foster’s conversion hit the crossbar and fell over for the 7-0 lead. The kicking game was absolutely crucial to the outcome, and Glendale flyhalf Hannah Stolba did well to keep her side in good attacking position. The next two scores came after sustained pressure in San Diego’s 22, and Stolba converted on the penalty opportunities, 7-6 after 15 minutes. Nichole Wanamaker did well to keep the defense guessing and chipped over the San Diego defense scrambling in its red zone. Gabby Cantorna put on a good chase and disrupted the pick-up for flanker Amandine Chatelier to do it down, 11-7. Two more lead changes would occur before the first half ended. Pankey dotted down the first of two tries, and then it was San Diego’s turn to pressure Glendale into mistakes. Another fast-moving drive saw prop Melissa Finkelstein in the sin bin, and shortly afterward prop Matelina Maluia was rumbling over the line. Foster converted both for the 21-11 lead. The points scored gave teams a second’s rest from a brutally physical game that only intensified as the match evolved. Joanna Kitlinski, Rachel Ehrecke and Sam Luther from Glendale, and Alexa Scott, Laura Easterling and Nicole Burr of San Diego – among many others – were so tough to handle, and forced teams to be quick in support and feisty in the breakdowns. A massive hit from Sarah Chobot led to a San Diego turnover, and from the scrum, Kitlinski broke and stepped three players to the try zone. Stolba was good for two, 21-18. And then with no time on the clock, a nice backline movement saw Cantorna loop around and put Kitlinski in for a second try, which was converted by Stolba for the 25-21 lead into the break. That oh-so-crucial momentum needed to be re-established in the second half, and Pankey was quick to claim it with a corner try, a very difficult kick that Foster nailed, 28-25. Both teams started to work in fresh legs at the 50th minute, and that lifted Glendale. From 30 meters out, Stolba kicked a penalty to tie it back up, 28-all. There the score remained for the next five minutes. San Diego kept punishing the middle – Burr was especially damaging – and then opening up room out wide, with MacDonald particularly effective in gaining ground. Two Foster penalties occurred within five minutes of each other: 34-28 to San Diego with approximately 15 minutes to play. Stolba got an opportunity to close the gap to three but the penalty kick missed. Nevertheless, the Merlins were in San Diego territory to stay. With 10 minutes to go, Glendale got the edge for which it was hoping: Surfers No. 8 Kate Zackary was yellow-carded, putting San Diego a player down for the rest of the match. Both teams emptied their energy reserves, as Glendale phase after phase sent its heavy hitters into San Diego’s defensive wall, which did not crack. There were hiccups here and there – a San Diego lineout that sailed over the top into the on-running Kitlinski’s arms, a not-releasing penalty that afforded the Surfers some relief – but in those final 10 minutes, the Surfers’ defense prevailed. The All-Blue Conference final was the most fulfilling of the weekend and really showcased the class of rugby that’s been building during the previous 10 years. The rest of the field also impressed, although bigger point differentials did result. In the 3rd place match, New York built a 28-0 first-half lead over Twin Cities through fullback Shamira Robles (2), wing Sarah Levy and flyhalf Kristen Siano, who was perfect on the day with conversions. Robles added a third try to start the second half, and then the Amazons wrestled control for the final 30 minutes. Ali Gillberg was especially effective in the breakdown, and Lanoira Duhart was pumping those legs late into the game. Wings Kaelene Lundstrum and Ariana Koras (2) scored for the 35-15 final. Berkeley only held a 10-0 lead over ORSU during the first half of the 5th place game, but those flashes of danger became more continuous in the second half. The Jesters again deployed a very effective ground game, led by poaching expert Rachel Johnson, but Berkeley countered well. Katie Chou in particular was driving over rucks, stealing ball and making positive tackles off the fringe. In the end, Berkeley’s outside striking ability of the All Blues overwhelmed ORSU.Madison Taylor, Serena Liu, Shelby Lin, Florence Gomez and Bulou Mataitoga (2) scored tries, and Sam Miller kicked two conversions. Johnson scored ORSU’s try in the 39-5 decision. Atlanta pulled away from Chicago North Shore in the second half of the 7th place game, winning 42-17 at home. Six different players scored, and Corinne Heavner added two penalties for the Harlequins, while Charli Jacoby, Betty Nguyen and Gabby Whittinghill dotted down for North Shore. Beantown dominated D.C. in the 9th place game, winning the day’s first game 55-17. No. 8 Yeja Dunn scored four tries on the day, while fullback Kelli Smith scored three.